I received a copy of this book to review for VOYA and then a few days later I got another copy randomly mailed to me from Scholastic. I guess the universe really wanted me to read this book. Lauren is the new girl in a small town that revolves around its high school football team. It’s unclear at first why her mother has abandoned her, forcing her to live with her uncle and his family, and whether or not she deserves it. She has found a loving family with them but she is afraid it will not last and that nothing will work out for her. Colby is the high school football star being recruited by top ivy league schools who secretly wants to stop playing football and study bridges. To stop playing football would disappoint his father, so he keeps his wishes hidden and tries to do right by everybody else. When Lauren and Colby meet they both sense a kindred spirit and a chance at happiness. 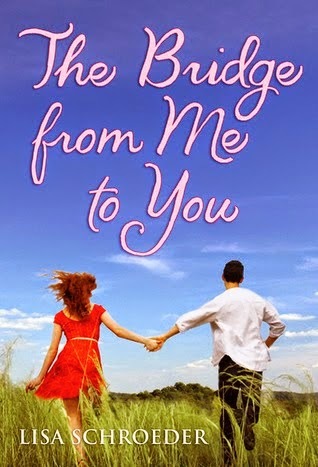 The Bridge From Me to You is classified as a romance book but it is so much more. Lauren and Colby’s romance is sweet and slow, but it takes a backseat to larger themes of family and strength and finding one’s self. Lauren must deal with her issues with her mother before she can truly commit to a relationship with Colby, likewise Colby has to face his father. The author lets them work out these issues and develop a friendship instead of jumping into insta-love. The novel is written in alternating chapters of poetry (Lauren) and prose (Colby) that serve the story well. It is a very quick engrossing read that Sarah Dessen fans will appreciate.